Since joining the Union and building the British Empire, Scots have rather forgotten the close ties they once enjoyed with Europe. The ‘Auld Alliance’ with France (forgotten by most French) was the least of it. From the Middle Ages onward, Scots exploited trade, craft and other opportunities unavailable at home all around the North and Baltic Seas. It took Scots most of the 14th century to recover from Edward I’s depredations and ridding the country of his baleful influence. In that time, pivotal castles like Dirleton were rebuilt and new ones like Tantallon added. The English being otherwise engaged extending their Angevin Empire (known to them as ‘The Hundred Years War’) the Scots were left to develop. The English became further occupied with a dynastic civil war they call ‘The War of the Roses’, leaving Scots to exploit what benefits relative peace could bring. Initially, the main continental trading partners of Scottish burghs were German merchants in Flanders. Before 1321 Scottish merchants had established a staple in Bruges (through which all wools, hides, etc were channeled). Although Bruges remained the major trading partner, from the 1460s trade also developed with Middelburg, Veere and Antwerp. Trade with Danzig, Stralsund, and Hamburg also developed so that by the 1380s an annual average of 7,360 sacks of wool and 36,100 leather hides were exported, in exchange for grain and luxury goods like fine cloth, wine, pottery, armour and military equipment. 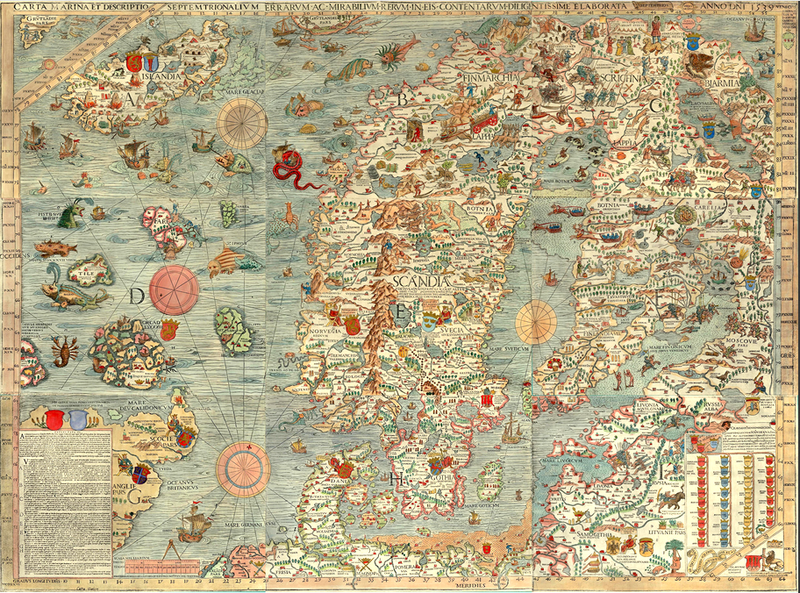 Medieval Carta Marina by Olaus Magnus, showing Scotland’s major trading partners. The major beneficiaries were Berwick and Leith, with smaller East Coast ports from Dunbar to Aberdeen joining in. Because of Haddington’s prominence, Aberlady (now silted up) played a prominent role barely remembered today. To supervise the trade and exploit opportunities, many Scots moved abroad. In 1508 James IV moved the Staple to Veere where, even today, their museum is housed in De Schotse Huizen. But the larger international exploits of Scots were in the Baltic. Bulk grain was available through Baltic ports and Scots became established on the Pomeranian coast, especially in Poland through its main connection with the west—Danzig (Gdansk). In 1474 twenty-four vessels are recorded as arriving there from Scotland. 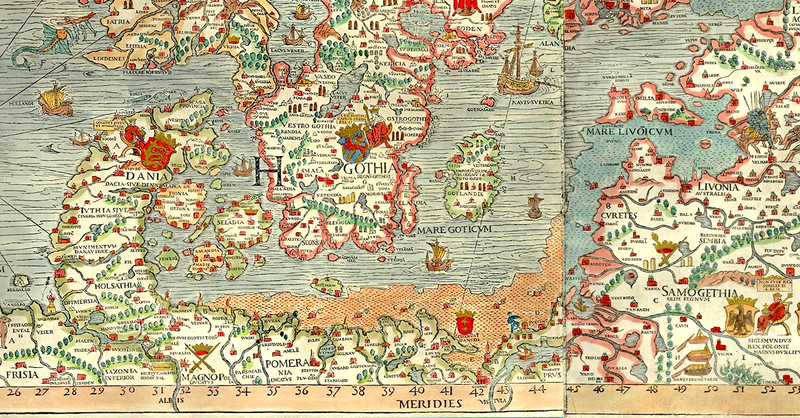 Since the late 14th century, the Baltic region enjoyed strong trade links. Many of the timbers used in the building of Queen Mary’s House in St Andrews were shipped from Danzig 600 years ago. Religious tolerance, an escape from poverty and famine, and the promise of adventure and riches prompted many Scots to seek a future there—so many that it boasts two suburbs named Nowe and Stare Szkoty (New and Old Scots). Many arrived as traders, going on to contribute much to Scottish culture. Robert Gordon made a fortune through the Aberdeen-Danzig trade route, and donated some £10,000 to the foundation of a hospital in his hometown. Four hundred years later the building is better known as Robert Gordon University. William Forbes, known as ‘Danzig Willie‘, built the spectacular Craigievar Castle on the back of his trading profits. Sir Robert Skene’s investments helped Aberdeen develop the largest granite quarry on earth. Poland boasts several villages named Nowa Szkocja (New Scotland), Dzkocja, Skotna Góra, Szotniki or Szoty. Scottish surnames are surprisingly common—MacLeod as Machlejd; Ramsay as Ramzy; Polish phone books are full of them. The religious tolerance of the Polish-Lithuanian Commonwealth made Poland an attractive place for Scots for persecuted Scots to establish themselves. There were also 50,000 Scots raised to fight in the Thirty Years War, largely under Gustavus Adolphus. Came the peace, many settled. In the 17th century, Poland was described as ‘Scotland’s America’; there were at least 30,000 Scots living in Poland. Krakow was one of the main cities in which they settled, and in 1576, the Scottish community in Krakow was so large Poland’s King Stefan Batory assigned a district for them to settle in. Some managed to rise through the ranks to notable positions, such as suppliers to the royal court. Alexander Chalmers (Czamer) became Mayor of Warsaw four times between 1691 and 1702 and has a plaque at his former home in Warsaw’s Old Town. So, our welcoming Polish Army units in WW2 and the recent EU influx of workers from Poland and Lithuania should be seen in context, as a re-establishment of international links with nearby old friends from which three centuries of empire-building in distant climes diverted us and almost made us forget. This entry was posted in Community and tagged Medieval trade; Hanseatic ports; Baltic. Bookmark the permalink.